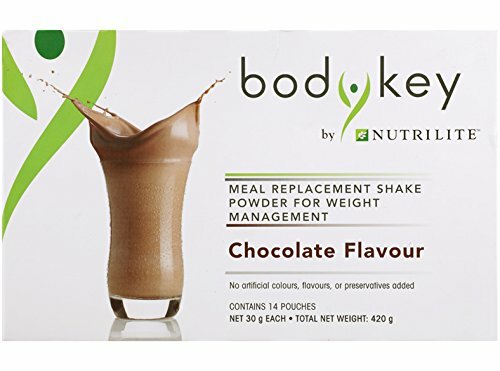 BodyKey by NUTRILITE Meal Replacement Shake (Chocolate) gives you a full meal as it contains all the nutrients an adult needs to go through a busy day. Made of 25 vitamins and minerals, it provides your body with one third of its daily nutritional requirements while keeping the calories low. Furthermore, the fibres can fill you up for quite a long time. Control your weight with BodyKey Meal Replacement Shake. Contains 25 minerals and vitamins, zero trans fats and non-GMO ingredients. BodyKey Meal Replacement Shake (Chocolate) is the ideal meal replacement shake to manage your calorie intake. It brings you healthy nutrients in a convenient way to control protein size while meeting the body's nutritional requirements. When mixed with 250ml of skimmed milk, it helps you feel fuller for longer and maintains lean muscle mass. If you have any questions about this product by Amway, contact us by completing and submitting the form below. If you are looking for a specif part number, please include it with your message.